My daughter is 2 years old and always on the go. If she's not physically running all over the place, her imagination is running wild. This year when I began thinking about what to put in Annabella's stocking, I knew I wanted gifts that she would actually play with and would not get broken the day after Christmas. Here is a list of similar items I put in her stocking this year. *This list contains affiliate links. This Superheroes set is a favorite here at our home! You can find this set here. When Annabella is in the mood for coloring, we pull out her Color Wonder markers and coloring pages. 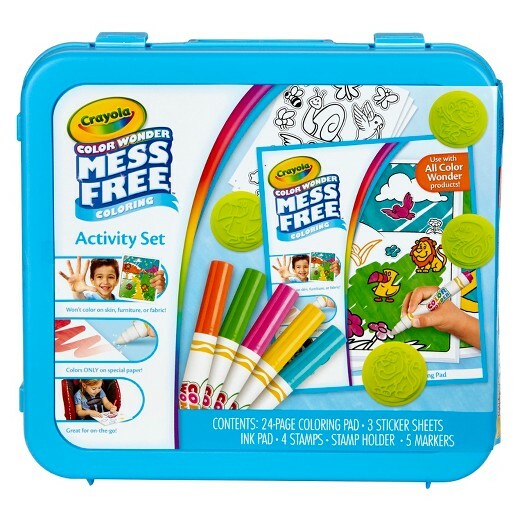 These are perfect for little kids who want to color on EVERYTHING. We also have regular crayons and coloring books, which are my favorites. So I realize this might be for the braver parents out there, but no matter your feelings on this messy toy, it makes a great gift for little ones. I can't wait to see Annabella's face on Christmas morning when she opens her very first Play-Doh! We are always adding to Annabella's collection of music toys. This set comes with so many instruments to wrap up and put in your little one's stocking! Annabella loves her snacks - fruit snacks, Gold Fish crackers, dried fruit, basically anything that is classified as "snack foods." So put some of her favorite snacks in her stocking! I think she gets just as excited for snacks as she does for new toys!